I have always been passionate about making things out of ideas. One of the great joys is to start from a whim or a flash of inspiration, breathe life into it, make it real, and share it with others. Drawing, photography, writing, cooking, startups – they all begin as a spark or sometimes a compulsion. They take form through art and craft and passion, and eventually emerge on some trajectory .. sometimes they soar, sometimes limp, sometimes fall to the earth with a thud. They don’t always deliver on their early glittering promise. They can morph in strange and unforeseen ways, yielding the delightfully unexpected or the disappointing or the just plain weird. I write about that compulsion in a blog about inspiring teams and achieving goals, because the desire to create is one of the oldest and strongest human needs. We have an accompanying penchant for destruction, unfortunately, but out of the fire and ashes we always begin again and go on to even greater acts of creation. If you can get a team to commit whole-heartedly to some shared act of creation, the result can be magical. The idea is the beginning. It can be flickering and unformed, or it can spring forth almost fully shaped. It often comes at odd times when my mind is drifting. I try always to keep a journal nearby and scribble in it often, filling it with fragments and half-glimpsed visions. Just writing down the beginnings of an idea often starts me along the path. Then comes that moment when you have to begin the work. That can be hard; you aren’t inspired, you aren’t in the mood. Your tools feel awkward and balky – they don’t fit your hand. You know that what you are making will be clumsy and lifeless. In your mind you saw glittering potential, yet here is this pale, lifeless thing that petulantly takes shape in front of you. You question why you bother, who needs the hassle, it’s all pointless. Maybe I should go pay some bills – at least then I’ll have done something useful. But sometimes, it happens. From somewhere outside your conscious control, the work takes on a form and shape of its own, and you feel that you are the means and not the maker. It’s a magical feeling, and it has produced some of my favorite results. 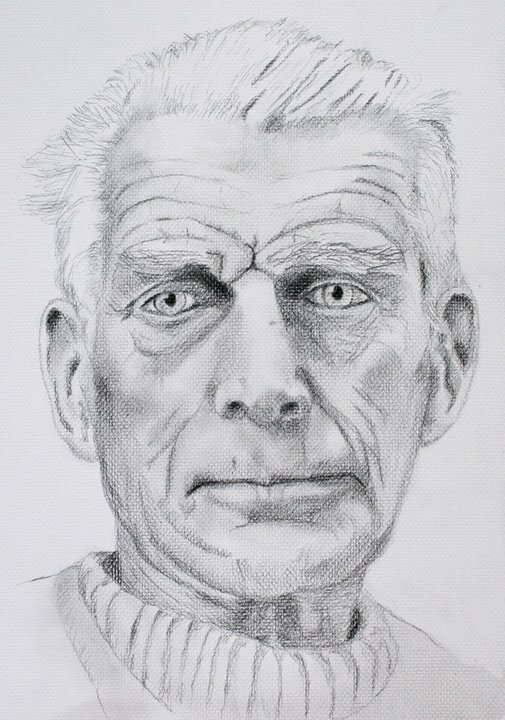 I was leafing through a book of portraits, and was absolutely struck by one of Samuel Beckett, the playwright. He looked just like an Old Testament prophet, his craggy face filled with the marks of a long life, his eyes piercing – I could feel the weight of that stare, the rough texture of the skin. I wanted to build that up, layer after layer, smearing the graphite with my hands to connect with that tactile sense in my brain. When I look at the drawing, I remember the feeling of shaping the skin and picking out the pupils of the eyes. I don’t know exactly how it turned into those marks on the page. But I see what I felt when I looked at the picture. I can pick out the technical flaws, but what matters to me is that I captured what I wanted to express. The moment when you feel like you have broken through, at least for the moment … bliss. But will it happen again? I think that’s why artists can be so superstitious, with their muses and their rituals. After waking up at 5 AM, poet Maya Angelou heads to a nearby hotel with legal pads, a bottle of sherry, a deck of playing cards, a Bible and Roget’s Thesaurus. Per her instructions, hotel staff members have removed all the art and photos from the room’s walls. Before leaving in the afternoon, Angelou usually completes between 10 and 12 pages during her stay, which she edits later that evening. American writer John Cheever wore his only suit of clothing each morning as he rode the elevator down to a basement room where he worked. Upon arriving there, he would undress to his underwear, hang up his suit, and get to work. He would dress to go back upstairs for lunch and again at the end of his day when he would ride the elevator back home. In addition to the enforced discipline of a ritual, it seems like they are trying to recreate the conditions that have brought the visitation upon them, because what if it never happens again? What if it abandons you, leaving you sweating and struggling on your own, forcing out work that can never be as good as what came before it? To be left staring glumly at a blank sheet that refuses to fill itself with prose breathing life, or a drawing imbued with its own spirit. I manage to keep my clothes on and work at home .. though perhaps I’d be a better artist if I reconsidered? I have learned that the only way I can tempt that inner spirit to come forth is to sit down, take a deep breath, and dive in .. even when the water looks cold and dark and uninviting, when there are a hundred other easier and more comfortable things to do. I try to create something every day, however small or incomplete, even when I’m not in the mood. It’s like exercise – you don’t always feel like doing it, but once you start, you often get swept up in it. I think it is exercise .. for the brain, and it takes just as much discipline to make yourself start. Are you being a spasmodic Hercules? I’m a fan of Anthony Trollope, who was an amazingly prolific British writer in the nineteenth century. While working full time for much of his life, he produced 47 novels and a variety of other works. The novels were typically hundreds of pages long and many of them are regarded as classics; if you want to try one with a lot of contemporary resonance, you might like “The Way We Live Now”. It’s about a financial manipulator who insinuates himself into upper crust society (a terrific miniseries was made of it starring David Suchet). How did Trollope produce such a huge body of consistently excellent work? This quote from him offers a clue: “A small daily task, if it really be daily, will beat the labors of a spasmodic Hercules.” He was very self-disciplined about writing, finding ways to weave it throughout his life even while he was in a demanding full time job. Trollope’s experience reinforces something I’ve often seen and experienced – the power of habit, and conversely how difficult it is to achieve something big if you try to pursue it with isolated bursts of activity. Some things can be done in short sprints of effort, applied at uneven intervals, but many important and transformative things cannot. You won’t learn a foreign language or start a company or play an instrument well or get in shape, without putting in the time and doing it regularly. This is not a new idea .. Aristotle (who managed to achieve a thing or two) wrote about it a few thousand years ago, when he said “you are what you do habitually.” You may know about a more recent take on the notion in Malcolm Gladwell’s book “Outliers”, where he talks about the magic of working 10,000 hours to master an activity. Gladwell has found many fields where the people who hit that number have become dramatically better than everyone around them and achieved remarkable results. You aren’t going to accumulate that kind of experience unless you are doing it virtually every day for many years. The investment adds up over time. When we’re forcing ourselves to do something, we often have a very poor sense of how much actual productive time we’re devoting to it. We vividly remember the times when we worked on our project, not the long stretches when we didn’t. We also remember all the time we spent thinking about doing it. But none of that really matters – what counts is the time you spend doing it. By making it a habit, you spend a lot less time thinking about it or planning it or stressing about not doing it .. and your regular investments of time really add up after a while. It’s just like the difference between saving money as a conscious act of repeated self-denial vs. having it deducted automatically from your paycheck. Habits take less willpower. This may seem counter-intuitive, but I’ve found that it’s far easier to do something as a habit. Once you have an ingrained habit, you don’t have to constantly force yourself .. it’s just what you do. For instance, take working out. For the past several months, I’ve worked out pretty much every day. At 6:15, off I go for a 45 minute session. I don’t think about it, I don’t will myself to go, it’s just the way it is. I used to work out regularly much less often, and then try to supplement it with additional time that I had to schedule. And that was always a struggle – a thousand other priorities competed with a workout, and they often (usually) won. As a habit, it just happens. There is some good advice in this article on how to make a habit really stick – committing for 30 days, doing something daily, starting with a manageable piece, and so forth. I thought this blog entry from Martin Varsavsky was also very interesting – he has founded seven companies, runs a large non-profit, and he writes and speaks prolifically. He writes about how he keeps so many things going at once, and it is by having carefully streamlined his life. He’s cultivated a set of habits that save time, and has eliminated many that waste it. Like television. I find many of his ideas to make sense (our family “cut the cord” on television ten years ago, and it has been a great success for us). I radically disagree with some of his other decisions, like not reading books – I’ve been an obsessive reader since I was 4 and would be miserable without having books as a constant presence in my life. But the point is not whether you agree with his decisions .. it’s to think about your own life as carefully as he has and find ways to optimize it for what makes you feel happy and fulfilled. What important goals could you be achieving by turning them into habits?